Founded in 1957, Donwell was one of the first companies in the U.S. to offer Teflon™ industrial coating services. Donwell has been a Licensed Industrial Applicator of Teflon™ industrial coatings since DuPont/Chemours™ first instituted its licensing program. Following are some of the unique properties of Teflon™ and some tips for choosing the proper Teflon™ coating for your application. Contact us today to discuss your application with an experienced Donwell engineer. The following characteristics are common to all Teflon™ industrial coatings in varying degrees. The unique combination of properties inherent to all Teflon™ industrial coatings make them a natural choice in a number of industries. NON-STICK – Very few solid substances will permanently adhere to a Teflon™ coating. While tacky materials may show some adhesion, almost all substances release easily. LOW COEFFICIENT OF FRICTION – The coefficient of friction is generally in the range of 0.05 to 0.20, depending on the load, sliding speed, and type of Teflon™ coating used. HEAT RESISTANCE AND CRYOGENIC STABILITY– Teflon™ can operate continuously at temperatures up to 550°F and can be used for intermittent service up to 600°F with adequate ventilation. Many Teflon™ industrial coatings can withstand temperatures as low as -454°F without loss of physical properties. CHEMICAL RESISTANCE – Chemical environments usually do not affect a Teflon™ coating. The only chemicals known to affect these coatings are molten alkali metals and highly reactive fluorinating agents. NON-WETTING – Since Teflon™ finishes are both hydrophobic and oleophobic, cleanup is easier and more thorough. UNIQUE ELECTRICAL PROPERTIES – Over a wide range of frequencies, Teflon™ industrial coatings have a high dielectric strength, low dissipation factor and high surface resistivity. Certain coatings are electroconductive enough to be used as an anti-static coating. The choice of Teflon™ industrial coatings is wide, and understanding a bit about the technologies involved makes the selection process easier. For any particular end use, there may be several Teflon™ industrial coatings that will perform well. Drawing on experience of a Licensed Industrial Applicator like Donwell Company is a good way to identify the best Teflon™ coating for a given application. However, there is no substitute for testing in the actual end use in making a final selection. The types of Teflon™ coatings available are described in the following paragraphs. Please contact Donwell to discuss which coating is most appropriate for your application. PTFE coatings have the lowest coefficient of friction and highest temperature resistance of any of the Teflon™ coating systems. PTFE–based products can typically withstand temperatures of 550°F (290°C) on a continuous basis and up to 600°F (315°C) for brief periods. PTFE coatings are very good electrical insulators and are extremely non-wetting. They are inert to almost all chemicals, but are somewhat porous and thus permeable to water vapor and other gases. The substrate must be able to withstand a cure temperature of at least 700°C to consider PTFE based coating. 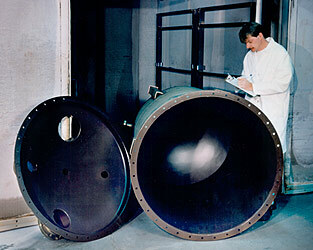 FEP-based Teflon™ coatings have superb release and are frequently used as mold-release coatings. They melt flow to smooth, non-porous films, and are thus more chemically resistant than PTFE coatings. FEP coatings have lower heat resistance than PTFE coatings (400°F/200°C), but also cure at lower temperatures. FEP coatings are extremely non-wetting and have a very low coefficient of friction. PFA-based coatings combine the high temperature resistance of PTFE coatings with the ability to achieve non-porous, chemical-resistant films like FEP. 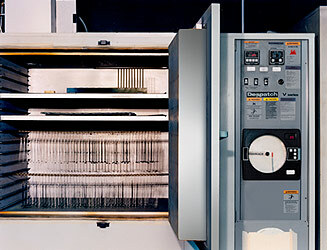 Films can be built to 25 mils (640 microns) and are quite tough and abrasion resistant. Release and coefficient of friction are very good. Teflon™ is a registered trademark of Chemours™ used under license by Donwell Company.